1. The Representation of the "Irreal"
The creation of Virtual Reality or cyberspace is not a matter of creating an artificial space in the same way in which one would create an imaginary universe. The creation of Virtual Reality aims at manipulating ontology. Virtual Reality is not just a second imagined reality, but exists as a world of its own, obeying its own ontological laws. It is tempting to use the distinction between an imaginary universe and an entirely autonomous, virtual one for establishing the difference between Virtual Reality and the reality of art. "Art" can be, or for some people even should be, apprehended by means of ontology; it is clear that this "ontology" cannot be the same for reality and for Virtual Reality. In general, in Western aesthetics, one would hesitate to call a work of art "virtual." Though the reasons for this hesitation are multiple, the most essential point is certainly the following: Western art, as much as Western philosophy, is mainly preoccupied with reality. "Reality" is not necessarily the "reality out there" but can also be the reality of art which is also seen as "real," as "something" that has been imagined and which is therefore different from "real" reality, but which is still not "virtual." Or, seen the other way round: A work of art creates a kind of reality which, even though it may be immersive and provide a certain amount of "authentic" experience, is conceived as an imagined reality and not as virtual. 1) Both icons and Noh-plays create a presence that exceeds simple appearance. The creation of this presence requires a high degree of formalization and regulation, as well as the shunning of individual creativity. 2) Both icon and Noh maintain an interesting anti-relationship with Western-European "realism" that allows them to appear "virtual." 3) The "meditative" character of icons as well of Noh makes (aesthetic) "experience" the central theme of (religious) art. The first two points concern the particular form of "presence" obtained in Noh-plays and icons, a presence that necessitates extreme "formalization" as well as a well-defined attitude towards anti-realism. It has been said that the Noh-play creates a "reality of its own," providing a paradoxical � reality effect" which is simultaneously opposed to realism. Within certain limits, the Noh-play represents an � ideal image of reality; � however, this � ideal image � is not simply the representation of an idea, but arises out of continuous acts of severe formalization. Instead of as a realist or idealist representation, the Noh appears as a "stylized presentation, [which] gives nevertheless convincing impression of something that is real and natural." (Toshio Kawatake) Similar things can be said about the icon. The icon, as a Christian art, treats the human person as a corporeal and at the same time spiritual being. For icon painters it has always been out of the question to present the human being within a concrete cultural and historical context as it was common, for example, for Renaissance artists. Still, icon art is not abstract but is firmly linked to the concrete: Like the Noh, the icon strives to create a certain kind of � spiritual concreteness. � However, this spiritual concreteness will be realized only through tradition, meditation, and rules that have been well elaborated by preceding generations of painters. For this reason, for Noh artists just as for icon painters, nothing is left to imagination, intuition or abstraction, but the reality of artistic representation remains a strictly formal one. Before entering into more detailed philosophical examinations let me show that the parallelism in question is perhaps not as surprising as it appears to be. There are indeed parallels between Japanese Zen-aesthetics and the "Byzantine" aesthetics of Old Russia. Since their exact location can, of course, only be undertaken in a separate article, here I will only draw a brief sketch of what I consider as most striking. Like in Japan�s Zen culture (by which the Noh is influenced), in Old Russia, aesthetics also occupied a large part of the place that Western-Christian culture usually assigns to philosophy. Moreover, in both Eastern cultures, this aesthetics was supposed to examine "expressions of the spiritual." The Japanese are usually, as Kawatake has put it, "more concerned with five senses than with logic or reason." (Kawatake, p. 88) Similarly, the Old Russians "abhorred abstract ideas" (Bychkov) as long as they were not immediately linked to concrete artistic manifestations. The most striking parallel pattern in Japanese aesthetics is, of course, the phenomenon of y�gen, which represents the most essential element of the Noh aesthetics. This notion of y�gen, which is translated as "mystery and depth," is also often related to the notion of the "sublime." As becomes clear especially in the writings of Yoshinori Onishi, this notion maintains a close relationship with a formal quantity that can, in Western terms, be best defined as style. Y�gen�s function is to provide a description of nature that has "eliminated the distance between poetic description and object or topic and poet, rejecting the superficial psychological capturing of a subject." In other words, through y�gen, objects appear with an utmost degree of simplicity, which, in spite of the directness of the artistic expression (reminiscent of German Einf�hlung), is still not realistic. On the contrary, the effect of y�gen is, as has said Steven Heine, "nearly opposite to realism in that nature depicted in its primordial state completely mirrors the realization of authentic subjectivity." Again, this still does not aim at the "idealized image" of subjective feelings. "Reality" is expressed in a "meditative" way, and this is true for icons as much as for Noh-plays. What this "meditative" representation (which is perhaps most reminiscent of some Western ideas about style) actually is, will now be examined now by viewing both Noh and icon through the phenomenon of the virtual. The Noh-play is a classical Japanese theatre form that emphasizes the unity of word, dance, music and mystical experience and was developed especially in the 14th century by Zeami Motokiyo (1363-1443). Before discussing Noh in detail, however, it will be useful to establish its position within a larger context of Far-Eastern philosophy. This can best be done by locating its place within the above discussion of "Being" and the problem of the virtual. At the beginning of the present article I claimed that Western aesthetics views reality in terms of Being and therefore has problems in assigning a proper "ontological" status to the phenomenon of the virtual. To say it straightaway, in Far-Eastern art and aesthetics, as far as influenced by the Confucian, Taoist, or Buddhist tradition, the problem of incompatibility of the virtual and Being does not appear. On the contrary, Far-Eastern aesthetics easily agrees that art is in the first place virtual. Of course, like in Western aesthetics, explanations are complex and varied. However, the reasons for the equation of artistic reality and virtual reality should not be sought in a different eastern concept of Being. On the contrary, the philosophical idea of Being as a quantity composed of reality and non-reality mediated through human experience is something that East and West share (in comparative philosophy, reflections on Being often turn out to be the most convenient ground for exchange and communication). The reasons for the different attitudes towards the "virtual" in Eastern and Western aesthetics are rather to be looked for in the idea of experience that is valued differently in both traditions. Robert Sharf has noted that in their religious practice, Far-Eastern religions put an emphasis on experience, an emphasis not found in the West. For Sharf, Eastern religions are more experientially rooted, and phenomena like "intuition" or "purity of experience" are constantly highlighted. An essential part of Sharf�s observations possibly applies to Far-Eastern traditional arts as well. A variety of things can be said concerning the problem of "experience" in Eastern art, but I prefer to refer here only to the most important reason for the "purity" that Eastern art and religion strive to cultivate in "experience." An essential difference between Western and Eastern art consists in the fact that the latter does not take the equation of reality and being for granted. Furthermore, in eastern intellectual traditions shaped by Confucianism, Taoism, and Buddhism, there is a tendency to design "reality" as something that is essentially different from Being: Ultimately, reality is not seen as Being but as Nothingness. Here, nothingness is not understood as a lack of meaning potentially overshadowing the world of Being, but rather as the ultimate, immaterial ground of reality. The important point is that any art or philosophy that brings this fundamental equation of reality with Nothingness to consciousness, will - indirectly - depict "reality" as virtual. This means that through art, nothingness, though itself absolutely formless and invisible, can project itself into the visible world. I will now try to crystallize the particular notion of the "virtual" as it appears in the Noh-play by concentrating on the idea of "representation." It has been said that Japanese stage art does not represent but present (cf. Kawatake, p. 115). First this establishes a difference with western stage art, and second, it introduces the virtual into reflections on "representation." As mentioned, Japanese traditional theatre creates a reality of its own, and this lets its theatrical space appear as virtual. Compared to this, western drama appears as "realist." However, in no case does the western "realism" qualify Japanese theatre as "non-realist" in the sense that it would produce images that are simply "unbelievable," as they are too far removed from reality or "unlikely." On the contrary, in Japanese traditional theatre the level of presentation is even "purer" and more direct than in Western theatre, and therefore also more "real." As a matter of fact, "purity and "directness" are the components which bestow to Japanese theatre its "virtual" character. The reason for this is that the reality presented by traditional Japanese theatre, re-presents nothing, but is simply the presentation of reality itself. In this way Japanese theatre manages to found itself on Nothingness. Japanese theatre is thus not, like Western theatre, founded on the reality ("out there"), but it simply presents. Because of this constellation - and not because a certain "reality" would be represented in the most realistic way - an absolute "irreality" can, finally, be experienced as "real". One generally considers wooden panels with paintings representing a holy person or one of the traditional images of Greek or Russian Orthodox Christianity as icons [Greek eikon: image]. This definition is, certainly, narrow, since even in the Byzantine Empire there existed other manifestations of figurative art (mosaics, statues in materials reaching from ivory to metal) which, from around the mid 11th century on, should also have been called icons. Yet, icons are not only of Byzantine-Russian origin; icons also existed in East Asia and were even essential for the spreading of Buddhism, which the Chinese sometimes often to as the "religion of images." Buddhist "images" might be images in the most common sense of the word, but to them applies the "Buddhist condition" that Oscar Benl recognized as a working principle also for Noh-plays: Buddhism, especially Mahayana Buddhism, discourages "any attachment to colorful images of the world of appearance." The image of the icon is thus no illustration of something, it is no symbol and no metaphor, but "simply" the manifestation of something divine. In this sense Buddhist icons, like their Byzantine cousins are not, supposed not to represent but to be. Given the abundance of philosophical literature on the subject, I am, in the present article, mainly interested in the status of representation offered by Russian icons. The sacred art of old Russia distinguished itself from Greek-Roman, as well as from European Renaissance and post-Renaissance art in that it refused imitation or representation of the real world and of the psychological state of the human being. The church, together with its art, was supposed to "be" a "real world" following its own spiritual and material laws, enabling man to participate in the invisible world of the Holy Spirit. We must recognize the status of the icon as something that is supposed to "be." Iconoclastic criticism of icons was directed against the belief in the image as a living entity. While the relevance of this criticism might no longer be felt as strongly as it once did, a related point contributes still today strongly to the "strangeness" of icons. Annulling the Cartesian distinction between the sentient and the insentient, the icon�s claim to "present" and not to re-present obviously challenges the modern understanding of images. Even more, the icon�s state of "Being" as a pure presentation provokes theological, metaphysical, ontological, and semiotic confusion because it contradicts Platonic and Aristotelian models of reality by holding that something can be concrete and at the same time true. According to the Aristotelian-Platonic tradition by which modern science and philosophy are influenced, concrete things should first be dissolved into general ideas or conceptions before any statements about their reality in terms of Truth can be made. Representation in the icon, on the other hand, is not based on these models. Taking the cue from Dyonisos Areopagites instead of from Aristotle, the icon painter sees the world as a "cover" obscuring its true meaning or the essence. The icon, since it presents the true meaning or the essence of the world, is thus not an idea or a concept but the direct "uncovering" revelation of the image of God. Or, as Greek theologists expressed it, it serves as the "deutorotypos of the prototype;" or, more clearly: it is the reflection of divine reality. First, it should be said that the icon illustrates the truest example of a religious picture as defined by Hans-Georg Gadamer: "Only the religious picture shows the full ontological power of the picture. (...) Thus the meaning of the religious picture is an exemplary one. In it we can see without doubt that a picture is not a copy of a copied being, but is in ontological communion with what is copied." The icon is supposed to be not only the image of something invisible but the presence of an invisible reality. In this sense the icon is a presence, without simply overlapping with the presence of "subjective reality." However, it is also not "unreal" either, and it is not simply an imagined or remembered fact. The icon�s way of representing is thus symbolic in the largest sense of the term: the symbol�s representation is, in spite of its concreteness and materiality, not reduced but represents the full sense of the signified. Even more, through the influence of the signified, the signifier participates, as has said Egon Sendler, "in an opening towards the infinite." The iconic symbol tends thus, by its nature of representation, towards the "unsayable." In philosophical terms it becomes transcendental. The "reality" of the icon can also be called an infinity reflected in the finite. The task of the icon in no way includes the creation of an illusion of the subject or even it depicts, for, according to its very definition, the icon (...) is opposed to illusion. When we look at it, we do not only know but also see that we stand not before the person or the event itself, but before its image, that is, before an object which, by its very nature, is fundamentally different from its prototype. This excludes all attempts to create an illusion of real space or volume. The kind of reality produced by the icon is neither an illusion nor an imitation of reality but can be called � virtual reality � in the true sense of the term. This applies for the icon as much as for the Noh-play. However, before examining this � virtual � input, the � Western � idea of virtual reality must be explored more completely. What can be said about the western approach towards Virtual Reality thus far? As a matter of fact, it is diametrically opposed to the traditional Japanese as well as to the Old Russian Virtual Reality. On the one hand, western VR tries to found its reality on "nothing" (this is why it is virtual); but on the other hand, it clings to "reality" as the primordial model it strives to imitate. A typical phenomenon flowing out of this constellation is that of "immersion" as a means of producing an effect of "reality". This paradox seems to go widely unnoticed, though it is easy to recognize the absurd character of the overly abundant "it is just as if..." prefaces to descriptions of VR, meant to be comparative yardsticks which illustrate that everything is "really virtual." At the moment Virtual Reality claims to be autonomous and self-sufficient, there should not be any room for "as if..."
The lack of consistency and undigested treatment of Virtual Reality in popular as well as specialized discourses, has its root in a Western tradition of aesthetics that has yet to find much theoretical access to the idea of the virtual. Being "realist" in the sense described above, Western aesthetics and Western philosophy are so far unable to adopt the virtual as a term even remotely as important as that of "reality" or "imaginatio." Instead they focus on the representation of reality on the one hand, and on Being as an existential, and not necessarily representing mode of reality on the other. This, however, leaves no space for a simply "presenting" reality which, as a reality, neither represents nor exists in terms of "Being." Yet, this is the essence of virtual reality. In Western philosophical discourse, if the virtual appeared at all, it served as a contribution to formal classifications of beings like in the philosophy of Duns Scotus who claimed that things contain their manifold qualities not in reality but virtually. Or else it served the purpose of an absolute, Kantian, rationalism taking the virtual as its own ontological foundation, as is done in the philosophy of Bouterwek. When, quite unexpectedly, the virtual was recently discovered by Western thought, it appeared, curiously, not as a component of art but in the form of a quality sticking to a kind of non-existent space created by computers and through electronic communication. First, philosophy was conceptually rather helpless. There was almost nowhere to look for philosophical approaches that would systematically explain the nature of the virtual. Still, from the beginning it was clear that virtual reality was not simply a matter of illusion (similar to post-modern simulation) created by sophisticated technology. Though formally, VR appeared to be very much like television, it also included a psychologically and ontologically disquieting quantity. Terms like "transcendentality" or "Absolute Spirit" quickly occurred and could not be eradicated since. To many, virtual space spontaneously appeared as something "spiritual". My claim is that the phenomenon commonly known as "Virtual Reality" should be opposed to a more intimate type of Virtual Reality that does not aspire to create, as does the latter, a second reality, but that creates an irreality. Virtual Reality lacks the existential component that virtual irreality considers as its main purpose of existence. Onasch and Schnieper write: "Even at home, Orthodox believers are accustomed to singing appropriate seasonal hymns softly before the icon. (...) Here, without surrender of the self, the � vagabond � spirit of the Westerner can find peace. It is helpful to gaze at an icon in conjunction with the text of a hymn, what we call � meditation, � that is, the encircling of the true center. By doing so, we may experience what it is like to participate in the Eastern Church�s praise of Christ. � Icons: The Fascination and Reality (New York: Riverside, 1997), p. 103. 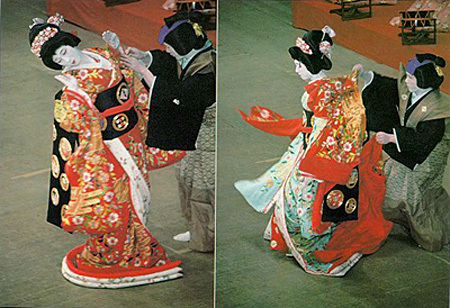 Toshio Kawatake: Japan on Stage: Japanese Concepts of Beauty in the Traditional Theatre (Tokyo: 3A Corporation, 1990), p. 45. Special Manuals or Pattern Books were considered binding for icon artists. 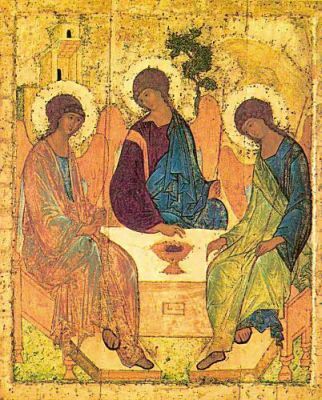 The so-called "gramota of the three patriarchs" (confirmed by the Tsar) established a strict hierarchy among icon painters and their respective works. The most important category of iconographers were considered the znameniteli and were responsible for the overall geometrical structure, the sketches and supervision of the final work. Bychkov points out that the use of Old Russian icons as objects for meditation by Daniil and his pupil Rublev was not unusual at that time. "Die Eigenart des russsischen �sthetischen Bewu�tseins im Mittelalter" in Ostkirchliche Studien 41:1, 1992 (pp. 22-33), p. 27. It is worthwhile to mention here another form of meditation practiced in the 16th century, aimed at the experience of what a Church Father called � superluminescent darkness. � Gold was conceived as a kind of absolute � non-colour ,� supposed to negate all other colours. The particular form of meditation pursued by these monks consisted in fixating on a pure gold background until the point when all other colours would disappear. The gold background was experienced as a kind of � absolute Nothingness, � as � the blackout of all objects, including the world of colour. � Konrad Onasch & Annemarie Schnieper: Icons: The Fascination and Reality (New York: Riverside, 1997), p. 287. Konrad Onasch & Annemarie Schnieper: Icons: The Fascination and Reality (New York: Riverside, 1997), p. 277. Quoted from Onasch & Schnieper, p. 277. Konishi Jin�ichi: "Michi and Medieval Writing" in E. Miner: Principles of Classical Japanese Literature (Princeton: Princeton University Press, 1985), p. 204. Theodor Lipps� aesthetics of Einf�hlung has been treated in Japan since right after its publication (1906) by Shimura H�getsu. Also the book Aesthetics (Bigaku, Tokyo, Iwanami Shoten), published by the Japanese aesthetician Jir� Abe (1883-1959) in 1917, drew heavily on Lipps. Steven Heine: A Dream Within a Dream (New York: Lang, 1991), p. 88. Cf. Jin�Ichi Konishi who writes: "The contemplative expressive approach involves the bracketing of a poet�s individual impressions and drawing near to the very essence of the subject. Once the essence has been regained, the poet will recommence grasping forms manifested on a more superficial level of awareness." "Michi and Medieval Writing" in Principles of Classical Japanese Literature, p. 204. Ryosuke Ohashi: �Ph�nomenologie der Noh-Maske" in Japan im interkulturellen Dialog (M�nchen: Iudicium, 1999), p. 91ff. Robert H. Sharf: "Experience" in Mark C. Taylor (ed. ): Critical Terms of Religious Studies (Chicago: University of Chicago Press, 1998), p. 94-98. David & Tamara Talbot Rice: Icons and Their History (Woodstock: Overlook Press, 1974), p. 11. Oscar Benl: Seami Motokiyo und der Geist des N�-Schauspiels. Geheime kunstkritische Schriften aus dem 15. Jahrhundert (Mainz: Steiner, 1952), p. 110. It needs to be said that, more than their Byzantine counterparts, Far Eastern icons are linked to relics whose presence, in Buddhist religion, was seen as pure and simple. A relic is, like an icon, non-representing. Kurt Weizmann: The Icon (London: Evans, 1993), p. 243. Cf. Sendler: "Tandis que le Christ selon saint Paul est la visible � image du Dieu invisible � (col. 1 15), l�ic�ne, comme le disent les th�ologiens grecs, est �deuterotypos du prototype� [meaning the �second existence of the prototype�]." L�Ic�ne: Image de l�invisible. El�ments de th�ologie, esth�tique et technique (Paris: Descl�e de Brouwer, 1981), p. 8. Hans-Georg Gadamer: Truth and Method (New York: Continuum, 1975), p. 126. The Russian icon�s similarity with its Far-Eastern cousins becomes obvious once again. The icon creates a "place of presence" similar to the East-Asian mandale which Sharf has named a "locus of the divine." Robert H. Sharf: "Prolegomenon to the Study of Japanese Buddhist Icons" in R. Sharf, E. Horton-Sharf (eds. ): Living images: Japanese Buddhist Icons in Context (Stanford: Stanford University Press, 2001), p. 18. Egon Sendler: L�Ic�ne: Image de l�invisible. El�ments de th�ologie, esth�tique et technique (Paris: Descl�e de Brouwer, 1981), p. 76. Leonid Uspensky & Vladimir Lossky: The Meaning of Icons (Crestwood: St. Vladimir�s Seminar Press, 1999), p. 41. The German Kantian philosopher Friedrich Bouterwek (1766-1828), a professor of philosophy at the University of G�ttingen and a contemporary of Hegel has coined the term � Absolute Virtualism �. It was meant as a kind of absolute intensification of the Kantian rationalist critique of idealism, though did not continue as an established philosophical branch. It did, however, leave traces in Schopenhauer as well as in French "spiritualist positivism" that prepared the way for Bergson. Bouterwek developed his ideas on virtualism in three consecutively written books, Idee einer Apodiktik (1799), Anfangsgr�nde der spekulativen Philosophie (1800), and Epochen der Vernunft nach der Idee der Apodiktik (1802). Though � Kantian � in essence, Bouterwek used also elements of scepticism, of Spinozism and of Jakobi�s Lebensphilosophie in these three books.